Last year, I ran a six part RPG for my gaming group set in the world of the Sentinels of the Multiverse. In the first post, I explained how and why I chose Fate Accelerated as the system for running the game. In this part, I want to explore the rules I used for building characters. There's a lot of options to choose from. Thankfully, Fate is a flexible system. In Fate systems, Aspects are short, descriptive phrases that illustrate your character and provide a pathway for gaining or spending fate points. Most Fate systems will have you create anywhere from 3 to 7 aspects for your character. One aspect that is constant from system to system is the "high concept," which summarizes your character. Tachyon, for example, might have "Super-Sonic Scientist" as her high concept. I though it would be neat for the high concept to be similar to the comic titles, or at least the hero sub-titles seen on some of their cards, although some of those were too short to use as a high concept, such as "The Inhuman Tempest." For the character names and high concepts, I ended up grabbing appropriate fonts from Blambot. This isn't really necessary for running the game, but I had a lot of fun doing so. You can see an example of this with the character sheet from the first part. An origin aspect that either explained the hero's background or tied them to an existing hero in the Sentinel Comics lore. A trouble aspect that represented a character flaw or personal challenge of some kind. A perk aspect, representing something positive about the character's personality, a skill or trait that made them stand out from the rest of their team. A power aspect, something connected to their powers that would synergize when their powers were being pushed to the limits. I didn't always stick to this paradigm fully, but I stuck to it for the most part. You can always adjust the parameters of character aspects, but I think this arrangement worked well and made for a well-balanced approach. There ended up being far less social interaction in my games, so the origin aspects almost never saw use, but it wasn't clear when I made the character that would be the case. Hard to care about the personal drama when you're dealing with stuff like this. Characters were allowed to have one approach at +3, two approaches at +2, two approaches at +1, and one approach at +0. This is the default for Fate Accelerated, and it worked just fine for this game. Likewise, each character had three stress boxes and three consequence slots, the recommended setup for a Fate Accelerated character. Even though I split these things up on the character sheets, this was merely semantics; the rules governing them were all the same. This is mostly in line with the basic Fate Accelerated rules, but some things were borrowed from other Fate systems. Weapon and Armor values, for example, aren't recommended for Fate Accelerated, but felt appropriate for a Sentinels game. I had toyed with including immunity to damage types as an upgraded version of damage reduction, but it didn't seem necessary at the time. Of course, sometimes "the rule of cool" supersedes what is on the character sheet, and that's okay. Previously, I mentioned how the character building interacted with Venture City Stories, a superhero RPG adaptation of Fate Core. You might wonder why I went to all of this trouble when a superhero Fate game already exists. 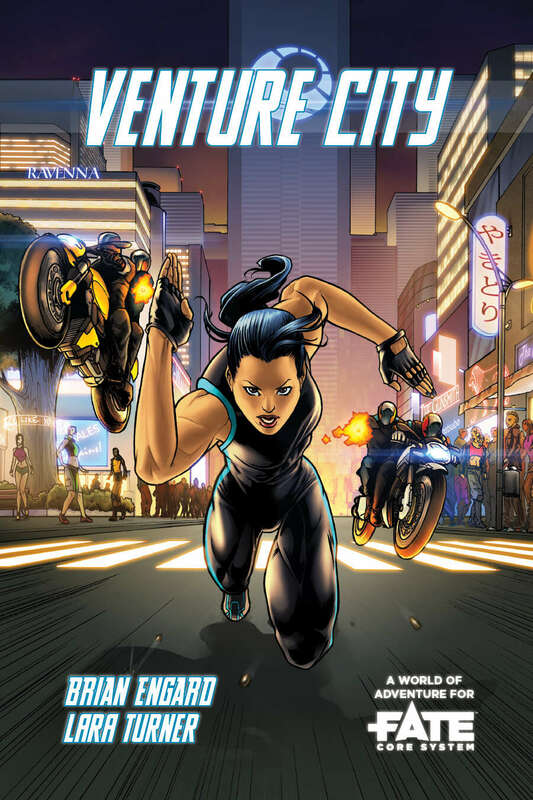 Besides my explanation for choosing Fate Accelerated over Fate Core, the Venture City Stories book is fairly specific to the setting laid out within. Interesting as that was, it wasn't suitable for a Sentinels game. However, it did contain a method for organizing heroic abilities that I thought worth adapting. Now, Venture City Stories is available as a "pay what you want" PDF, so it's technically free, but I would be remiss if I simply reproduced their content here. Still, I think I can briefly explain how these work without stepping on any toes. Update: When I wrote this post, Fred Hicks, the current steward of the Fate system, was holding a Kickstarter to expand the various Fate settings and print offerings. One of the rewards that came out of that campaign was to make the Venture City rules entirely free, part of the system Core. Feel free to check out everything I describe here! 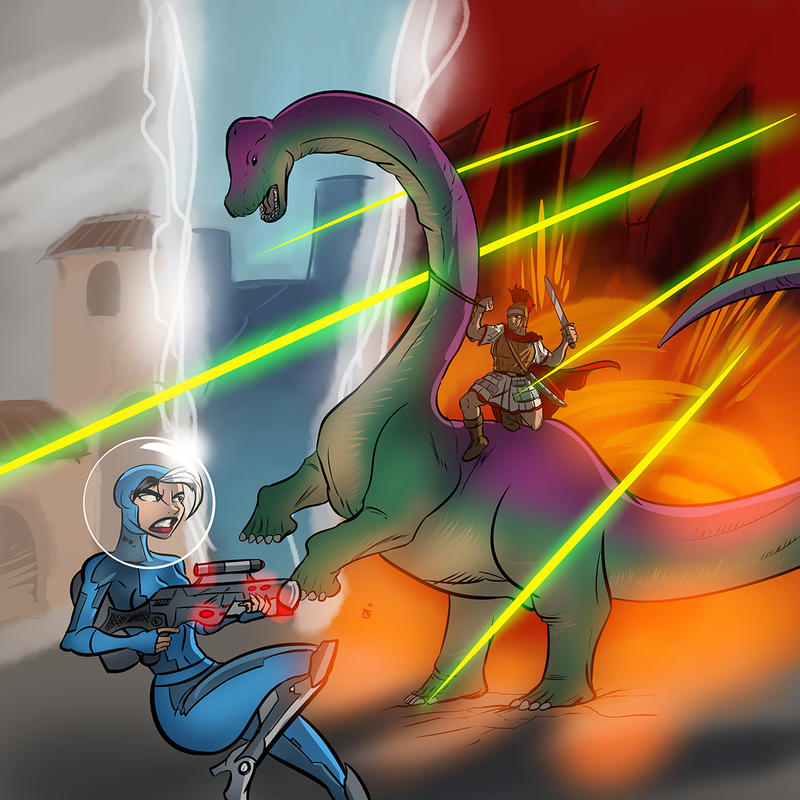 Special Effects were additional benefits that could be added on to a character's actions or attacks, either from spending a fate point or from succeeding with style. I used the default Venture City rules on these. Drawbacks are an aspect that can be compelled against a character's powers. such as The Wraith's "Lost Utility Belt" or Haka experiencing "Uncontrollable Rage." Collateral Damage was a special "overdrive" application of the character's powers, something very useful but also carrying environmental destruction or other unwanted side effects with it. Legacy, for example, could choose to simply ignore the stress of an attack, but that might result in the damage being redirected to an ally or the environment. Seriously, go spend a couple bucks on this. It's worthwhile. Next time, I'll discuss the story I told in this game and the characters that participated. It wasn't necessarily an original story, but it allowed my players to punch robots and dinosaurs, so I think it served its purpose.